Disney Stock Looks Undervalued. Is This a Buying Opportunity? The media and entertainment conglomerate is a high-quality business offering an attractive entry price for investors. Walt Disney (NYSE:DIS) stock is under considerable pressure lately. Shares of the entertainment powerhouse are down by more than 20% from their highs of the last year, mostly due to growing concerns about online TV and how it could affect Disney's networks business. Short-term uncertainty in fundamentally strong businesses can create buying opportunities for investors, and this seems to be the case when it comes to Disney stock. It's hard to argue the fact that Disney is one of the strongest players in the entertainment industry on a global scale. Brand differentiation and intellectual properties make the company one of a kind, and the business model is tremendously powerful, as Disney gets to monetize its assets via multiple venues at the same time, including movies, TV shows, music, toys and merchandise, and entertainment parks attractions. However, the company is facing an important challenge due to changing consumer demand in the TV industry. Many consumers are moving away from cable subscriptions and embracing online streaming services, and this is hurting traditional TV operators across the board. When looking at Disney's financial performance, the slowdown in the networks division is quite noticeable. Revenue grew by a modest 2% in this segment last quarter, while segment operating income remained flat year-over-year. Thanks to materially stronger performance in segments such as studio and entertainment parks, Disney still reported rock-solid financial performance for the quarter, with total revenue growing 9% and total segment operating income increasing 8% year over year. Nevertheless, the networks business is clearly dragging on overall performance. Disney is not standing still in the face of changing consumer demand, though. The company has recently invested $1 billion in acquiring 33% of BAMTech, a leading technology services and video streaming company with plenty of experience in sports streaming. Disney CEO Robert Iger explained the rationale for the acquisition in the press release: "Our investment in BAMTech gives us the technology infrastructure we need to quickly scale and monetize our streaming capabilities at ESPN and across our company." According to a report from The Wall Street Journal, Disney is also working on a deal with Alphabet's (NASDAQ:GOOG) (NASDAQ:GOOGL) Google to join a cable-TV style streaming service that Google is developing. The service will reportedly be called Unplugged, and it could provide a smart venue for Disney and other traditional TV operators to join the online streaming revolution by partnering with an internet juggernaut like Alphabet. It will probably take time and effort for Disney to completely adapt to the online TV revolution, but the company has both the financial and strategic resources to successfully do so. In spite of short-term challenges in the industry, the company's fundamentals remain intact. According to data from Morningstar, Disney stock is trading at a price-to-earnings ratio of 16.7, a discount compared to the average P/E of 24.4 for companies in the S&P 500 index. Additionally, the average P/E for Disney over the past five years stands at 19.3, so the stock is also cheap by its own historical standards. 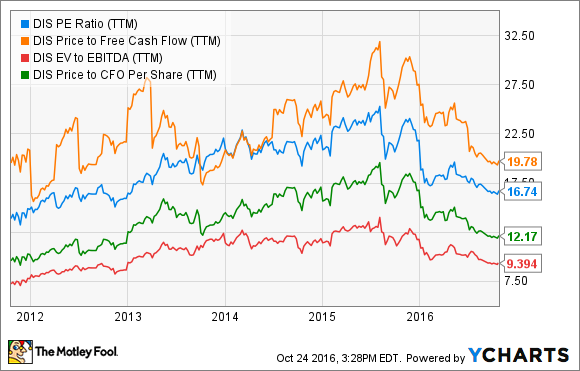 The following chart compares different valuation ratios for Disney in the past five years, including price to earnings, price to free cash flow, enterprise value to EBITDA, and price to operating cash flow. Multiple indicators are pointing in the same direction: Disney stock is currently priced near the low end of its valuation range over this period. The online TV boom is not a risk factor to disregard, as it can have a material impact on Disney's performance in the networks division. However, Disney owns tremendously valuable content, and this is a key strategic advantage. Distribution channels can change over time, but content is king in the sector, and Disney comes second to none when it comes to content quality in the entertainment industry. In spite of slowing performance in the networks segment, Disney is still doing exceptionally well at the companywide level, and it has the strength to adapt to the online TV paradigm over the years ahead. Buying high-quality businesses at conservative valuations is a time-proven strategy for superior returns, and Disney stock is offering an attractive entry price for opportunistic investors right now.